The number of people buying plane tickets may be down, but that’s not stopping the nation’s airports from getting all gussied up in their holiday best. And while everyone’s budget is tighter than usual, travelers will still find plenty of airports hosting contests, carolers, karaoke and opportunities for a last-minute heart-to-heart with Kris Kringle. In my most recent “At the Airport” column on USATODAY.com, I offered a round-up of what’s in store. This Saturday, December 12th, 2009, the Indianapolis International Airport (IND) will host Pups, Popcorn & Perfect Pitch in the pre-security Civic Plaza. There will be free treats from Just Pop In! and two “petting” zoos: one with instruments from the Indianapolis Symphony Orchestra (ISO) and another with adoptable animals from the Humane Society of Indianapolis. On December 14th at Phoenix Sky Harbor International Airport (PHX), listen for the US Airways Chorus. 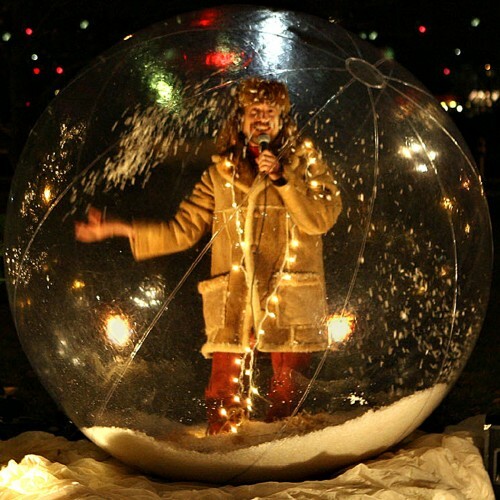 And on December 16h, look for JJ Jones, the Human Snow Globe, at Nashville International Airport (BNA): he’ll be the one inside a giant inflatable bubble singing wacky Christmas songs. On December 21st, the Judy Lee Dancers (dancers are all 60 years old and up) will perform at Austin-Bergstrom International Airport (AUS), And on December 23rd, a choir made up of local Austin-based TSA employees will present a medley of traditional Christmas carols. Like many other airports, there’s a full schedule of holiday entertainment at Minneapolis-St. Paul International Airport (MSP), where you can also pick up a coupon book filled with 80 coupons that can be used at MSP’s stores and restaurants. The booklets are available at information booths throughout the airport and on-line at ShopsatMSP.com. As in past years, many retail shops and volunteer organizations will be offering free, post-security gift wrapping stations at various airports. Look closely at the paper being used at the San Diego International Airport (SAN) December 18th through December 23rd: the artwork is by students in The New Children’s Museum’s After School Program. Karaoke was big at George Bush International Airport (IAH) last year and it’s back again this year on Saturday, December 19th. Karaoke is also on the schedule at Detroit Metro Airport (DTW). Their karaoke fundraiser takes place in the McNamara/Delta Terminal from Sunday Dec. 20th through Wednesday, Dec. 23rd. Anyone (or any group) stepping up to the microphone will be asked to make a $5 donation to a fund that will be split between two local charities. Participants will have their names entered in a drawing for a gift basket filled with items from Delta Airlines and airport vendors. Thanks for posting this, Harriet! We hope plenty of people will stop by to see our animals (and relieve flight-related stress by petting them). If someone is interested in a dog or cat, we have some good reasons to adopt during the holidays, and offer gift certificates good toward all of our services, including adoption, too. While supplies last, adopters can get 2 free tickets to ISO’s Yuletide Celebration.